Big Congrats to Cathleen – she discovered Oxeiptosis – a novel type of cell death – now published in Nature Immunology! Oxeiptosis is an apoptosis-like cell death that responds to reactive oxygen species (ROS). 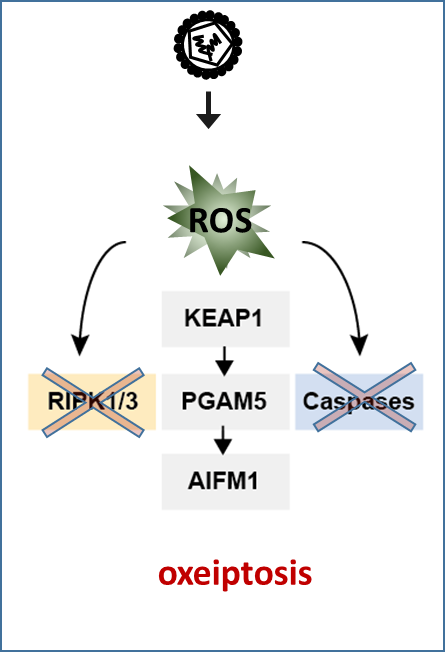 ROS activates the sensor protein KEAP1 and induces a caspase-independent cell death program that involves the phosphatase PGAM5 and its target protein AIFM1. Oxeiptosis is important to limit inflammation caused by influenza A virus infection and therefore functionally resembles an apoptosis-like cell death pathway that functions in the absence of caspases. Great work! Congratulations!